The Blizzard Black Pearl 88 is a fantastic option for the strong intermediate to aggressive skiing women who will be making smooth turns on the groomers, skiing some powder, and zipping through the bumps. Blizzard's Women's Carbon Flipcore Construction keeps the Black Pearl 88 very energetic and stable anywhere you can go on the mountain. A Poplar-Beech Wood Core will keep you stable when you are hitting top speed, or you run into some challenging snow conditions. The Black Pearl 88 uses a Ti Binding Interface to add extra rigidity underfoot and extra retention for the binding screws. A Sandwich Compound Sidewall Construction makes the Black Pearl a favorite for the ladies who are worried about edge hold on firmer conditions. The Black Pearl 88 has been a very popular ski and a best-seller since its inception, it's time for you to find out for yourself why this season! 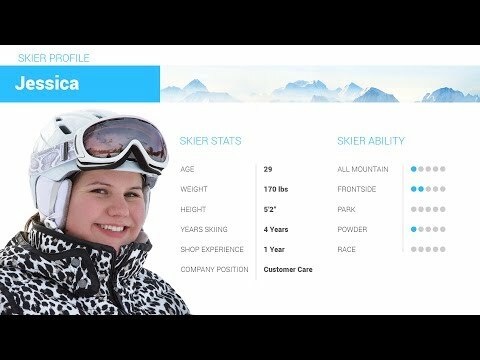 2019 Blizzard Black Pearl 88 Ski Review by Jessi. 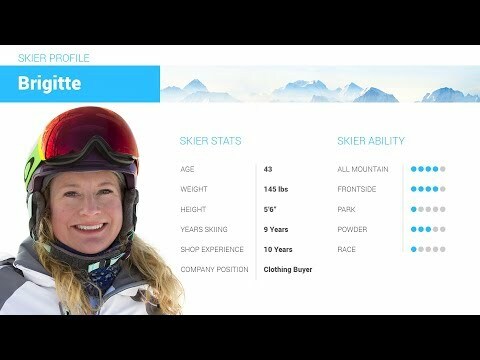 2019 Blizzard Black Pearl 88 Ski Review by Whitney . 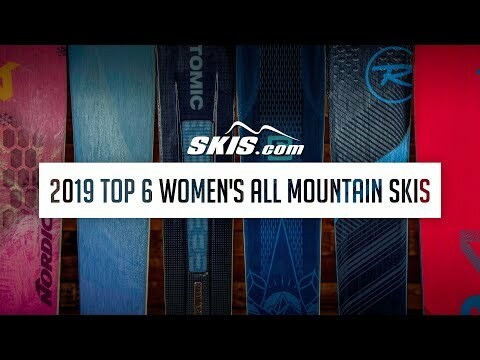 2019 Blizzard Black Pearl 88 Ski Review by Tori . Q: I am 5'6" and 125lbs. I am an intermediate skier, skiing mostly blue and black groomed runs, some moguls on the West Coast at Mammoth Mountain. Would the Black Pearl 88 be a good fit for me and would you recommend 152 or 159? A: This would be a good ski for you, especially if you are looking to keep improving your skiing. At your weight the 152cm would be the best length for you. Q: I want to use the Blizzard Black Pearl 88 for telemarking. I'm 51, 5'8, 145 lbs and an intermediate telemark skiier. I ski more in the east at resorts than in the west. What length ski would you recommend? A: At your weight and height for telemark we would suggest the 159cm length for you. Q: I am 4'11" and 145 lbs. I am currently on Nordica Belle to Belle 145 length and feel like I can not push myself on them. I like black and blue groomers and light powder day, but will go anywhere on the mountain. I am a first chair to last chair skier, and spend most of my time out west. I did demo the Blizzard Black Pearl 88 at 152 length, and really liked them and felt I ski'd better on them. Are they too big though for my height? A: The primary way we size skis is based on weight and consider height second. At your weight and height the 152cm is the size we would recommend for you. Q: I'm 30 years old, 5'10" and 118 lbs. I started skiing in Michigan at a young age and I currently spend 2-3 days a year skiing in Michigan and a week or so skiing out in Colorado. I'd say I'm an intermediate/advanced skier and I ski mostly blues and blacks. I'm currently using my mom's Volkl Aurena skis, which are ok, but I'd like to buy my own pair of skis. Would you recommend the Blizzard Black Pearl 88's? And if so, what length would you recommend? Thanks! A: The Black Pearl 88 would be a great ski for you. At your weight and height you are between the 152cm and 159cm lengths. If you prefer controlled turns and a ski that is easy to maneuver the 152 would be best for you. If you prefer longer turns and higher speeds the 159 would be better. Q: I am 50 years old, 5'8" and about 160 lbs. I am a timid intermediate skiier hoping to become more confident. I demoed the 98's at 159 cm yesterday and couldn't believe how much better I skiid than before! I am looking to purchase the Black Pearl and wondering if I should go with the 88's or 98's and either 159 or 166? A: Since you tested the 98 and are based in CA, I would recommend that you stick with the 98. Since you are generally skiing softer snow, even on the groomers the additional width will provide more consistency and a more stable platform for you. At your weight and height I would strongly recommend jumping up to the 166cm length, but as you tested, the 159cm length is still okay for you. Q: I want to buy the black pearl 88 this season. I am am 54, 5'4' & 125 lbs. I ski blue, black and some mogels. Looking for an all mountain ski but mostly ski the groomers but in the east coast need to deal with a lot of crud. I am intermediate skier but more on the conservative side. Would you recommend the 152 or 159? A: At your height, weight, and skill range the 152cm would be your best option. Q: I'm 5'3" and 154 lbs. I'm an Intermediate to Advanced skier on a good day. I like to ski blues, some blacks, some moguls, and some off trail. We mainly ski at Wolf Creek in southern Colorado where there's often a good amount of powder, but my preference is skiing on packed or light powder. I currently ski on Elan 140 skis that I purchased used from a ski rental shop. I'm trying to decide which length of these Black Pearl skis would suit me best. A: Based on your weight, ability and location I would recommend the 152cm Black Pearl 88 for you. Q: I'm 5'10" and 195lbs, intermediate to advanced skier, age 59 years, skiing primarily on East Coast in VT, NH, MA and CT, blues and some blacks. Would you recommend 173 cm length? Or would 166 cm be okay? A: Based on your weight and ability I would recommend the 173cm for you. Q: I'm 5'7" and ~140 lbs. I ski mainly at Squaw Valley, ski aggressively, and like off piste, powder, and groomers in that order. I also like to ski Utah, Colorado, Big Sky, and Jackson Hole a few days a year each (I ski 100 days/season), so what would be the recommended length for me on a pair of Black Pearl 88s? A: Based on your weight, ability and preferred terrain, I would recommend the Black Pearl 98 at 159cm for you. Both skis have an identical construction, but the wider footprint will give you better flotation and more control since you spend the majority of your time in the good stuff. Q: I'm in a dilemma whether to get the 159 or 166 Black Pearl 88s. I am 5'-6" 135 pounds and 60 years old. I ski around 25 days a year at my local western ski area. Been skiing my entire adult life and I consider myself an advanced skier. I stay on the groomed runs and ski at an average speed. My area gets a fair amount of snow so I am frequently on fresh corduroy a lot which I love. I don't have a desire to go off trail however, I do love skiing through new powder on the groomed runs. I am currently on Salomon Bamboos 162 cm. They feel about right for me. I am concerned about sizing up but sizing down doesn't feel quite right either. But maybe the rocker/camber/rocker Pearls at 166 ski similar to my more traditional camber/tip rocker 162 cm Bamboos? Any advice for me? A: Based on your weight, ability, terrain choices and experience I would recommend the 166cm. There is more rocker in the Black Pearl than your Bamboos. The more rocker in the ski the shorter it feels.